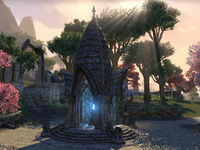 To the Altmer, Tanzelwil is one of the most sacred sites on Auridon, combining the functions of temple to the Elven ancestors and mausoleum of the ancient kinlords. The High Elves cremate their dead and then bury the ashes in wall shrines. 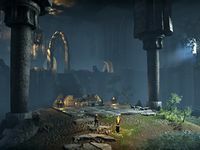 Tanzelwil is a haunted elven ruin in southern Auridon, due west of the town of Phaer. 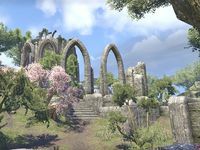 The ruin is a traditional worship site for Altmer royalty. 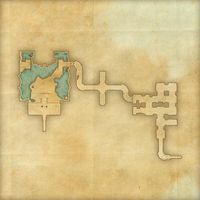 Tanzelwil Objective: Help the Queen uphold High Elf traditions. Tanzelwil Wayshrine is located east of Tanzelwil, on the road running between Tanzelwil and Phaer. This page was last modified on 7 April 2019, at 04:09.